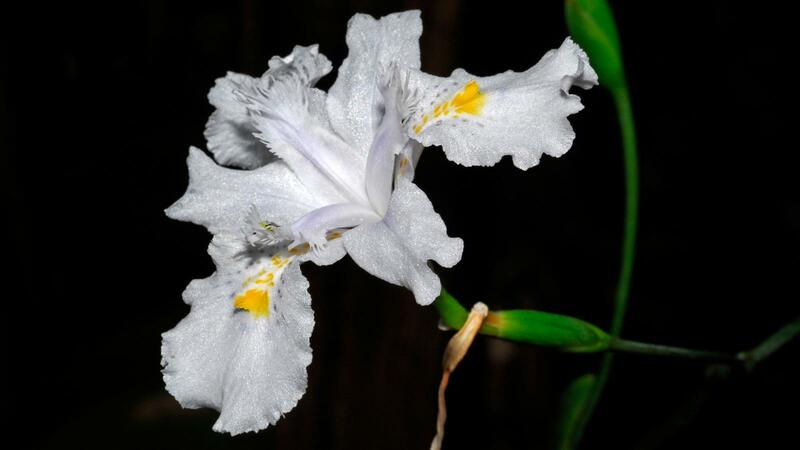 Iris japonica is common in many parts of China and Japan and was introduced to Europe in 1792 from China by Thomas Evans of the East India Company. It was named in 1794 by Carl Peter Thunberg (1743-1828), a Swedish physician and botanist, who was a protégé of Linnaeus. Thunberg was employed by the Dutch East India Company and visited Japan from 1775-1778 (at a time when Japan was closed to most Europeans) and collected an impressive array of plants. 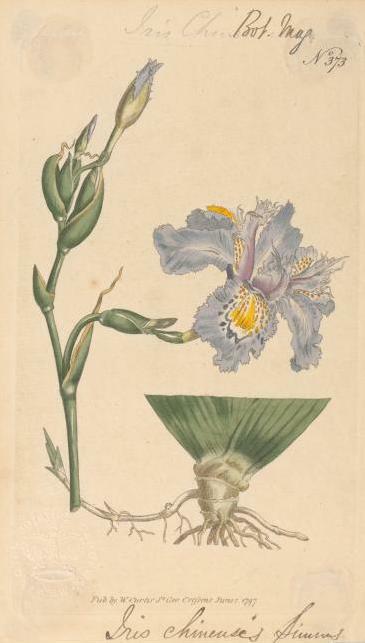 The great botanical artist Pierre-Joseph Redouté included a painting of this iris (known at that time as Iris fimbriata) in his Choix des plus belles Fleurs (1827-1833) (translation: 'Selection of the most beautiful flowers'), a fitting tribute to such a beautiful plant. A native of Japan (except Hokkaido), where it is common in wooded hills, and westwards to Burma and Sichuan in China, it occurs from 500-800 m (2,400-3,400 m in southwestern China). It is widely cultivated, and it is possible that the high-elevation plants from southwestern China are naturalised rather than native. Iris japonica is a perennial that spreads by creeping, above-ground rhizomes that root at intervals. The leaves are sword-shaped, evergreen and shiny green on one side but duller on the other. They are arranged in a broad fan and measure 30-80 cm long and 2.5-5.0 cm wide. The flowering stems are erect, branched, 30-80 cm long with white, pale blue or purple flowers measuring 5 cm in diameter. The falls (three of the six perianth segments in Iris ) have fringed margins and a yellow-orange crest. The flowers open in succession from March to May. The fruit is a capsule appearing from May-June. Two popular cultivars include Iris japonica 'Ledger' that has white flowers with purple markings and an orange crest, and I. japonica 'Variegata' with creamy-white striped leaves. Iris japonica is widely cultivated as an ornamental, either as an outdoor plant (in sheltered areas) or in a cool greenhouse. It has received an Award of Garden Merit from the Royal Horticultural Society. In Chinese herbal medicine, the rhizome is used to treat injuries, and a decoction of the plant is used against bronchitis, rheumatism and internal injuries. Iris japonica is easy to grow in warm temperate gardens or a cool greenhouse. Flowers can be susceptible to late spring frosts and will fail to flower after exceptionally cold winter weather. Iris japonica can be seen growing in the Duke's Garden. Kew's Economic Botany Collection contains samples of rhizomes of Iris japonica . Grassy and rocky slopes, open forest margins in hills and among rocks by streams. 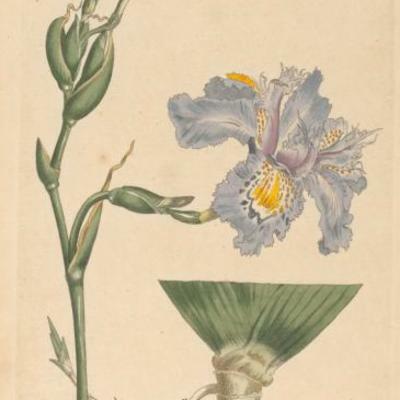 All parts of both wild and cultivated Iris are poisonous, especially the rhizomes (swollen stems). Akhter, C. & al. (2013). 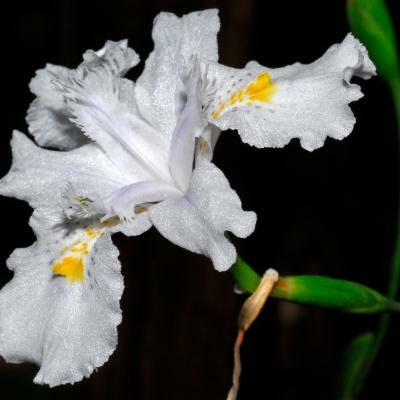 A taxonomic appraisal of genus Iris L. (Iridaceae) in Kashmir himalaya, India Iranian Journal of Botany 19: 119-126. H?, P.-H. (1993). Câyc? Vi?tnam. An Illustrated flora of Vietnam 3: 603-1176. Pham-hoang Ho, Montréal. Marais, W. (1978). Flore des Mascareignes 177: 1-16. IRD Éditions, MSIRI, RBG-Kew, Paris. World Checklist of Selected Plant Families (2010). Iris japonica. The Board of Trustees of the Royal Botanic Gardens, Kew. Flora of China. Iris japonica. 24: 307. Phillips, R. & Rix, M. (1991). Perennials, Vol. 1. Pan Books, London. Stearn, W. & Rix, M. (1987). Redouté’s Fairest Flowers. Herbert Press/The British Museum, London. Duke, J.A. & Ayensu, E.S. (1985). Medicinal Plants of China. Vol. 2. Reference Publications, Algonac, Michigan. Ohwi, J. (1965). Flora of Japan. Smithsonian Institution, Washington D.C.